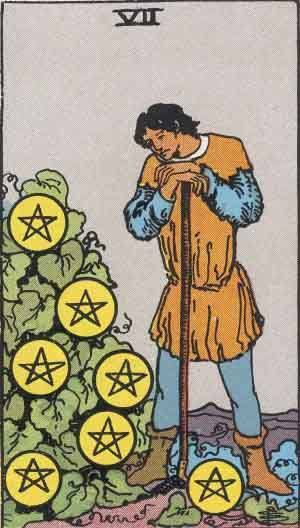 The Seven of Pentacles is the seventh card in the suit of Pentacles. A positive card, you should expect good things to happen when you see it. The illustration shows a man growing crops (crops of Pentacles) and peacefully watching over them. He has put in the effort to nurture them to grow and is about to reap the reward of his prior work. The Seven of Pentacles represents slow and steady growth, continuing, and forward thinking and planning. Past – The Seven of Pentacles in the Past position could mean that you’ve spent a lot of time, hard work and energy getting to where you are now, and it’s time to reap the rewards. You may have an excellent knowledge that you can help others with, especially people who are starting out in the world. Present – The Seven of Pentacles in the present position means life is slow and steady, you are reaping rewards of past sensible thinking and planning head for the future. Remember to be safe with whatever you are doing, take precaution. You might feel ‘stuck’ where you are now, and the Seven of Pentacles being drawn might mean you’re going to be here for a little while longer. You can make the most of it by doing your best in your current paradigm and eventually overcoming your boundaries. Future – The Seven of Pentacles in the future position suggests a long path of continued growth. Have you just started something new? Expect it to be an ever growing part of your life. This could be any aspect; a new job, relationship, hobby, friendship. Whatever it is, you should expect good things if you continue to dedicate yourself. Work / Education – The Seven of Pentacles in regards to work or education means that things are improving. They have already, haven’t they? If you’re looking for a job, it might be a good time to go back to your roots. Consider your past successes, and how you would be able to go about recreating them in the present. Look into how you can use your knowledge to further set yourself up later on in life. Become known in your field, or class, as someone people have to come to for information and knowledge on a particular subject. Romance – The Seven of Pentacles in romance means that you are invested in some sort of strong relationship. This could be an established one, or even something like a long-term crush or possibly an obsession. It’s a big part of your life either way, and its up to you what to do with it. In any circumstance, you should relax. The problems of today pale in the future, enough that we can even come to laugh about even the worst things. Friends – The Seven of Pentacles in regards to friendship could suggest a great friendship, likely a best friend. If you’ve got something in mind, a big trip, or something you’re thinking about doing with this person, go and do it. There’s no time like the present, especially if you have the means set up to do so. A slow and steady growth with new people is also possible, be open to new friendships and opportunities. Money – The Seven of Pentacles in regards to finances is an excellent sign. Considering the ‘investment’ interpretation of this card, expect a big, possibly overdue payout. Doing what you are already doing will benefit you in the future. Remember to put a portion away for the future and be wise with the rest. A farmer doesn’t throw his seeds everywhere but places them with careful planning. Health – The Seven of Pentacles suggests you are taking care of your body, mentally or physically, and it’s paying off. You could have just started, or are about to start, some new diet or exercise regime. Well done, if this is the case. It would be even better if you did this with other people instead of yourself. Spirituality and Mentality – The Seven of Pentacles in spirituality can mean that you’ve reached a plateau of thought. If you have a belief system, it might feel that you’re beginning to understand the deeper parts and connections of it, and how unified it truly is. You have enough knowledge to spread, if you want to make others lives better. In reverse, the Seven of Pentacles can represent a lack of vision in your future long term goals. You may be feeling a bit stuck and without either passion or drive at the moment. Don’t worry, as these feelings come and go. If you can dedicate some time to yourself to think about your goals, perhaps a quiet afternoon, you may be able to quieten your mind enough to come to some sort of revelation about what you want to do. In life, stop distracting yourself; you are capable of great things if you dedicate yourself to them. Finally, and although somewhat less likely, look out for others potentially coming along and stealing what you have created for yourself. Seven represents introspection and thought. The enneagram is a good representation of seven. The Seven of Pentacles in regards to numerology reminds you to continue planning as you are doing, to think a few steps ahead. The future might seem like a mess so take it one step at a time. What do you need to do today, tomorrow, by the end of the week? Set goals. If you have many sevens in a reading, it could suggest the need to calm down and think about your situation, even if you feel the need to act now. As a Yes or No question: No clear answer. Think about it for a while. The man in the illustration is growing his crops, so like an unripe harvest, you might be asking the question too soon. We’ve selected live tarot readers to give you a FREE 3 Minute interpretation of The Seven of Pentacles! Scroll through them below and pick your favorite one.